This wiki page introduces the OTC (Open Source Technology Center) Linux* Video team’s activities in the area of Video Framework and Processing. We actively work in the open source FFmpeg* and Gstreamer* communities to enable Intel hardware acceleration in the overall Video Open Source Ecosystem. We also host the libxcam project for Camera/Video processing. GPU/CPU hardware acceleration in widely adopted open source Linux video frameworks (FFmpeg and Gstreamer). 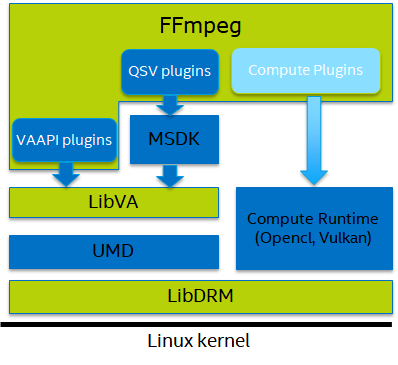 Open source video processing algorithms in libxcam and Linux video frameworks (FFmpeg and Gstreamer). GSoC (Google Summer of Code) is an international annual program, first held from May to August 2005, in which Google awards stipends, which depends on the purchasing power parity of the country the student's university belongs to, to all students who successfully complete a requested free and open-source software coding project during the summer. The program is open to university students aged 18 or over. FFmpeg is the leading and most widely adopted open source multimedia framework, able to decode, encode, transcode, mux, demux, stream, filter, and play almost anything that humans and machines have created. It supports the most obscure ancient formats up to the cutting edge. It is also highly portable under a wide variety of build environments, machine architectures, and configurations. The OTC Video team helps to develop and supply patches to support video hardware acceleration on Intel GPU in ffmpeg-vaapi, ffmpeg-qsv, ffmpeg-ocl, and other plugins shown in the following figure. FFmpeg-vaapi is an FFmpeg plugin, which supplies hardware acceleration based on the low-level VAAPI interface that takes advantage of the industry standard VA API to execute high-performance video codec, video processing, and transcoding capability on Intel GPU. FFmpeg-qsv is an FFmpeg plugin, which supplies hardware acceleration based on Intel GPU. It provides high-performance video codec, video processing, and transcoding capability based on Intel Media SDK library. FFmpeg-ocl is an FFmpeg plugin, which supplies hardware acceleration based on industrial standard OpenCL on CPU/GPU. It is mainly used to accelerate video processing filters. Gstreamer is a pipeline-based multimedia framework that links together a wide variety of media processing systems to complete complex workflows. It is a collection of libraries and tools to process multimedia content such as audio, video, subtitles, and related metadata. Gstreamer is a very popular open source framework. Intel GPU video acceleration is going through gst-vaapi and gst-msdk, as shown below. gst-vaapi is a Gstreamer plugin based on low-level VAAPI interface that takes advantage of the industry-standard VA API to execute hardware acceleration for video decode, video encode, and video post-processing on GPU through libva. 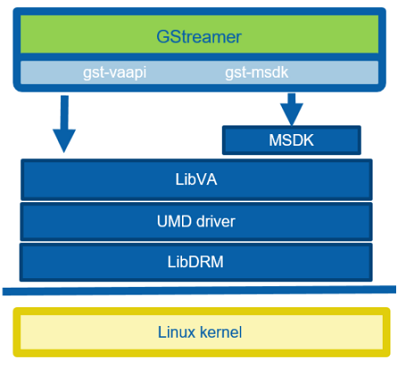 gst-msdk is a Gstreamer plugin (currently in gst-plugins-bad of Gstreamer plugin) for the Intel® Media SDK that takes advantage of Intel® Media SDK library to execute hardware acceleration for video decode, video encode, and video post-processing on Intel GPU through media SDK. Libxcam is an open source camera library for extended camera features, focusing on image quality improvement and video analysis. The library supports many features for image pre-processing, image post-processing, and smart analysis. This library makes GPU/CPU/ISP work together to improve image quality. OpenCL, GLES, and Vulkan are used to improve performance in different platforms. VAAPI (Video Acceleration API) is an open-source library (LibVA) and API specification, which provides access to graphics hardware acceleration capabilities for video codec and processing. Libva-utils is a collection of tests and examples for VAAPI. VAAPI driver is a hardware-accelerated video driver based on LibVA. It is a user mode driver (UMD). Intel supplies two open source VAAPI drivers for Intel GPU: intel-vaapi-driver (legacy) and intel-media-driver (new). The intel-vaapi-driver will be maintained per customer/production request. From BDW and SKL+, intel-media-driver for VAAPI is recommended. See this link for more details. All of these projects increase the speed and performance of video decoding, encoding, processing and transcoding on compressed digital video and imaging. They also support workload offloading from the CPU to the GPU. The latest Intel features mean decreased power use, increased mobile battery life and reduced power requirements for other types of devices as well. Major media codecs such as H.264/AVC, H.265/HEVC, VP8, VP9, JPEG/MJPEG, MPEG-2 and VC-1 are supported. Intel enables these projects with the goal of reducing product time-to-market, development complexity, build of Material costs, as well as making the user experience more enjoyable. The Linux for Intel Media project is utilized by Google* for their Chrome* OS, including currently shipping Chromebooks*. It is incorporated into Valve* SteamOS and customized Linux distributions, as well. Google also uses these projects for the popular Android* operating system. These projects are provided for operating system vendors, systems integrators, and original device manufacturers who are creating branded or customized operating systems for embedded devices, phones, tablets, convertibles, desktops, gaming and entertainment systems, and more. Independent software vendors that create applications and games can also take advantage of the freely available source code and binaries. These projects are written primarily in C and C++ programming languages, distributed under following open source license. The intel-vaapi-driver will not be actively maintained. From BDW and SKL+, intel-media-driver for VAAPI is recommended. For details about the Intel open source media-driver and its ecosystem, see link. Sound Open Firmware is an open source community that provides an open source audio DSP firmware and SDK for audio or signal processing on modern DSP. Please visit this link for more details.